Zeta Chi Chapter of Pi Kappa Alpha Missouri State University P.O. Box 442100 Lawrence, KS 66044-2100 Address Service Requested Attention: This newsletter is intended for alumni, undergraduates, and parents. 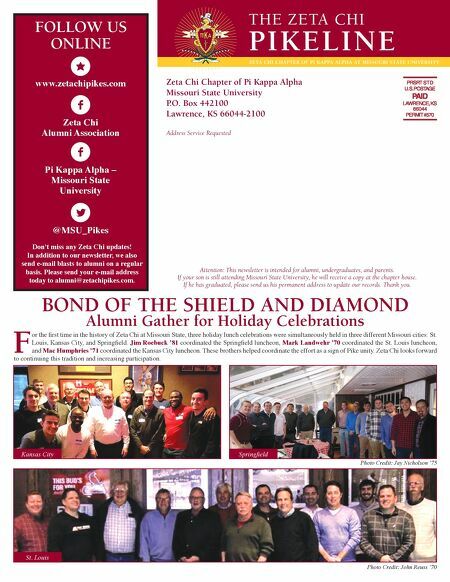 If your son is still attending Missouri State University, he will receive a copy at the chapter house. If he has graduated, please send us his permanent address to update our records. Thank you. THE ZETA CHI PIKELINE ZETA CHI CHAPTER OF PI KAPPA ALPHA AT MISSOURI STATE UNIVERSITY FOLLOW US ONLINE www.zetachipikes.com Zeta Chi Alumni Association Pi Kappa Alpha – Missouri State University @MSU_Pikes F or the first time in the history of Zeta Chi at Missouri State, three holiday lunch celebrations were simultaneously held in three different Missouri cities: St. Louis, Kansas City, and Springfield. Jim Roebuck '81 coordinated the Springfield luncheon, Mark Landwehr '70 coordinated the St. Louis luncheon, and Mac Humphries '71 coordinated the Kansas City luncheon. These brothers helped coordinate the effort as a sign of Pike unity. Zeta Chi looks forward to continuing this tradition and increasing participation. BOND OF THE SHIELD AND DIAMOND Alumni Gather for Holiday Celebrations Kansas City St. Louis Springfield Photo Credit: Jay Nicholson '75 Photo Credit: John Reuss '70 Don't miss any Zeta Chi updates! In addition to our newsletter, we also send e-mail blasts to alumni on a regular basis. Please send your e-mail address today to alumni@zetachipikes.com.